Easy, delicious and ready in under thirty minutes, this Spicy Low Carb Hamburger Soup is a hearty and warming dinner. Since it makes a large batch, there will be enough leftovers for lunches and dinners that week. This soup is also keto friendly. Who does not love soup? This recipe is as satisfying as my Creamy Tomato Chipotle, Skinny Italian Vegetable and Kicked-Up Broccoli Cheese Soups. Soup season is upon us, except for those few states who either never really cool off or just haven’t gotten there yet. However, I do know lots of us never stop eating soup, regardless of the season. If you’re inside with air conditioning I guess it really doesn’t matter all that much. 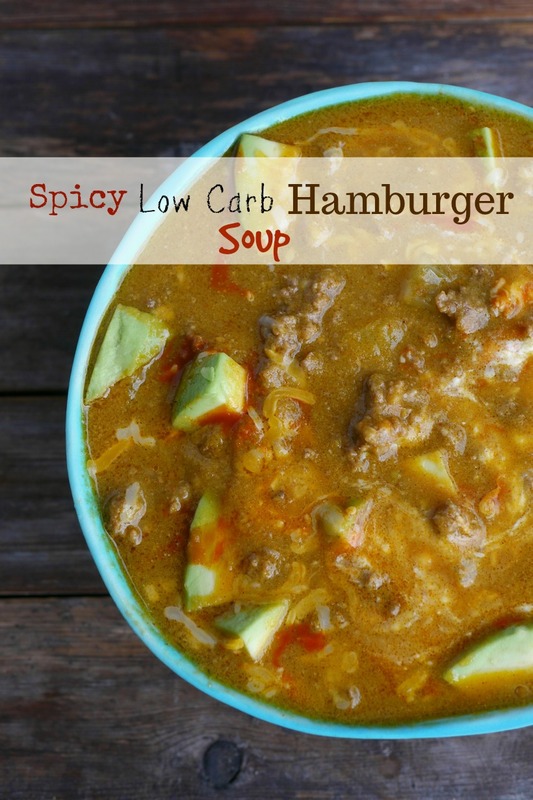 Luckily this Spicy Low Carb Hamburger Soup is going to fit into your lifestyle regardless of the weather. Enjoy it now or a month down the road. How many of of you like to enjoy low carb eating while at home and save all the indulgent eating for when you’re out or on vacation? I know once I became forty years young, sugary food or carbohydrate loading really does play a role when it comes to weight gain. Life is truly unfair sometimes. Meals like this Low Carb Bacon Cheeseburger Salad or an appetizer like Dill Pickle Dip do help when it comes to not loading up with carbohydrates. However, life is short so I also subscribe to the notion of eating all the things within moderation. Including this delicious soup! 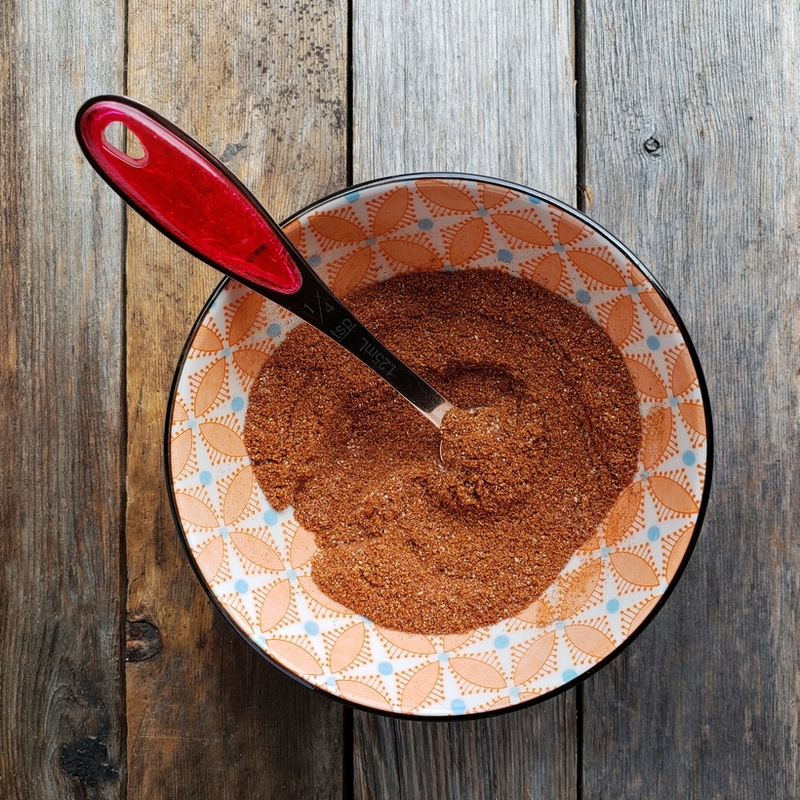 Homemade seasoning blends tend to be lower in carbs than store-bought, especially when it comes to taco seasoning. 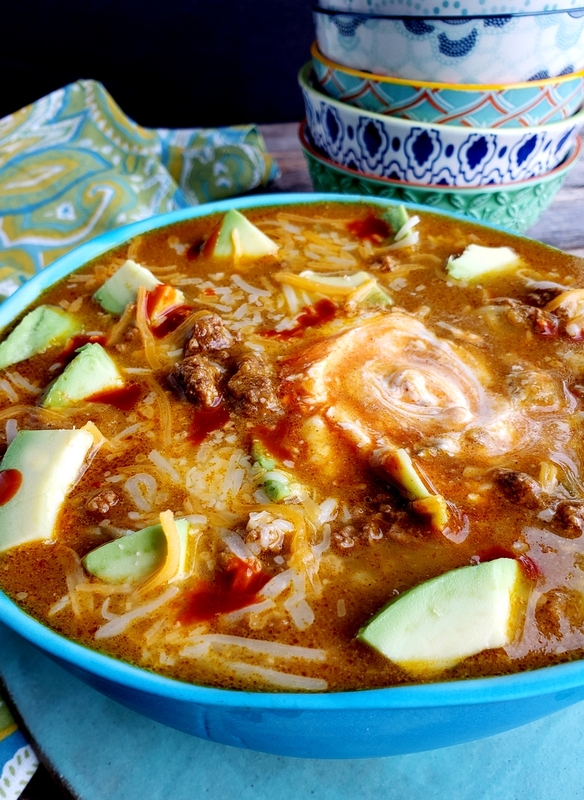 You can absolutely use premade taco seasoning in this soup if you choose, however they tend to be high in carbohydrates. I’ll leave it up to you. It will taste good either way. This is the perfect sized dice when it comes to the celery for this soup. It cooks quickly and that’s what you want. I know a lot of you will ask if this soup tastes like pumpkin. It does not. Make sure you use a can of one hundred percent pure pumpkin and not pumpkin pie mix. The soup has a very savory flavor that pairs nicely with the hamburger in the soup and other ingredients. If you could care less about carbs, I would serve this soup with this easy to make artisan bread. If you are really watching your carbohydrate intake, this is my favorite low carb bread. That’s really up to you and is dependent on the type of diet you might be following. If you are observing a low fat nutrition plan you might want to use ground beef with a 93/7 fat percentage. If you are on a keto diet, ground chuck or an 88/12 fat percentage will be a better choice. 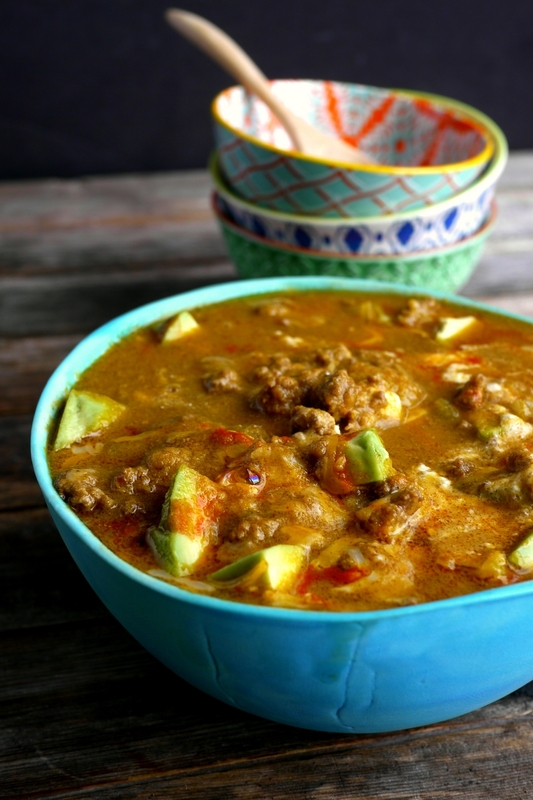 The ingredients and beef choice for this soup were made with ground chuck and the keto diet in mind. As indicated in the recipe, don’t forget to garnish your soup with extra cheese, chunks of avocado and swirl in a dollop of sour cream, it’s the best. I also can’t imagine this soup without my favorite hot sauce! Have you joined our cooking community yet? I’d love to see you there. Show me what you made on Instagram or Facebook and tag me at @NoblePig or hashtag it at #NoblePig. 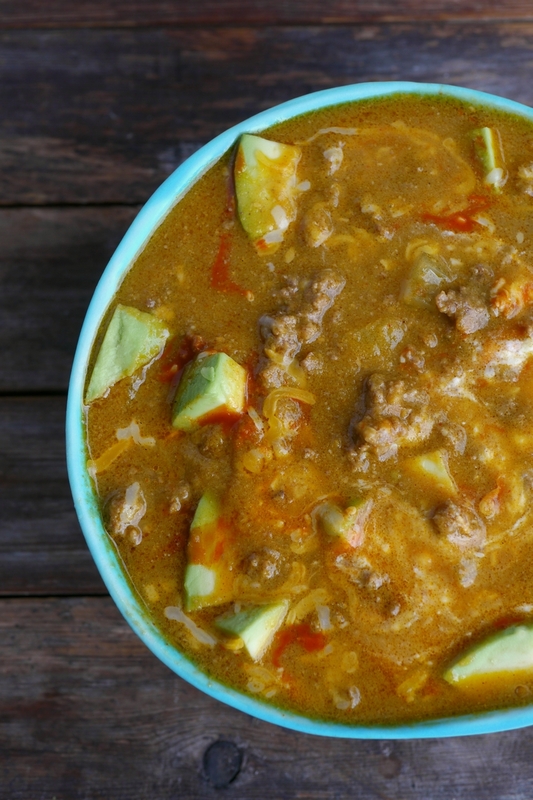 Easy, delicious and ready in under thirty minutes, this Spicy Low Carb Hamburger Soup is a hearty and warming dinner. Since it makes a large batch, there will be enough leftovers for lunches and dinners that week. This soup is keto friendly. In a small bowl, combine chile powder, paprika, cumin, garlic, onion powder, cayenne and salt. Set aside. In a large Dutch oven (7 quart), brown ground beef until almost done and add previously made seasoning blend, stirring to incorporate fully into the meat. 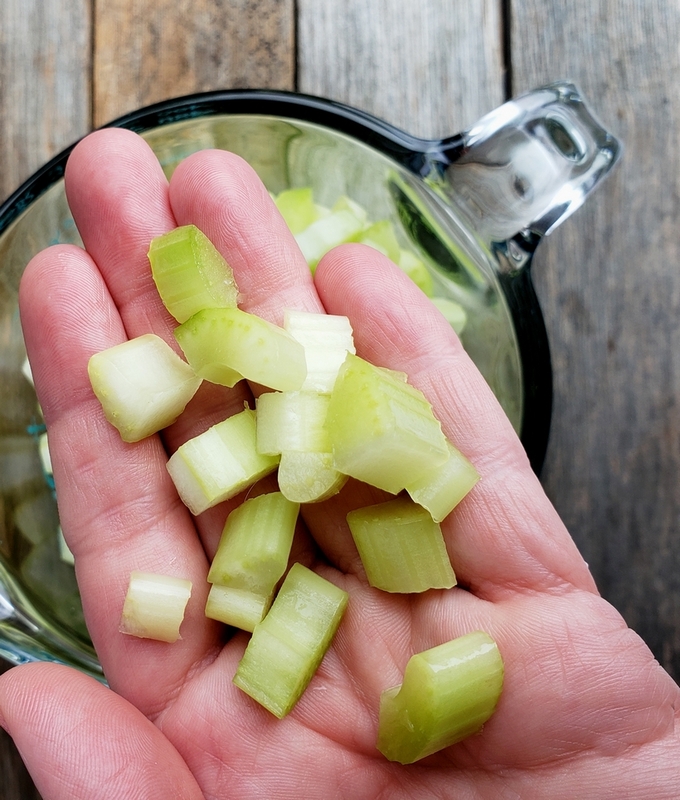 Add celery and continue to saute for about 2 minutes more. Pour in beef broth and bring to a boil. Meanwhile, in a blender, puree jalapenos, pumpkin and avocado until smooth. Add puree to boiling liquid and stir until fully incorporated and smooth. Turn off heat. Stir in cheese. Garnish each bowl with more avocado, cheese, sour cream and your favorite hot sauce. I could eat this every single dinner for the rest of my life. Ohh such a yummy soup recipe. This will happen this week I can’t wait! I’ve been looking for more low carb soups, and this has such fantastic flavors! This is totally my kind of soup! I love it! This is just way too delicious to be low carb! Yum! This looks like a perfect Fall recipe. 🙂 Just wondering if you use the “hot” or “tamed” jalapenos and whether you drain them first? Thanks so much. I do not drain them. And I use regular heat for the jalapenos. Excellent recipe. This soup looks so delicious. Actually followed all directions loved it! Keto is hard send me more please. Made this tonight and it was a hit. The whole family approved! I was so intrigued by the purée of pumpkin, jalapeños and avocado. It was so good by itself too😀. Could you make this in the Instant Pot? How long would you cook it for? It’s ready in less than 30 minutes so I’m not sure why you would use an instant pot?